Located in the town of Tenno in the Trentino-Alto Adige/Südtirol region is a wonderful example of how nature can create something beautiful and majestic. 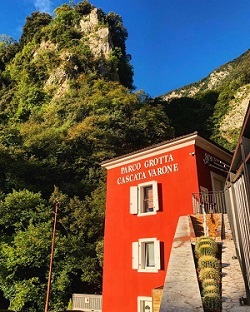 Just 3 km (1.86 miles) from Riva del Garda, a town on the northern tip of the Lake Garda, is the Parco Grotta Cascata Varone. The Varone waterfalls and gorge are a rare geological phenomenon that is a must-see attraction. Experts believe that this gorge started over 20,000 years ago when waters from the Magnone torrent started to erode the rock. Underground losses from Lake Tenno, just north of the area, unleashed this torrent and as it found a crack or cavity the force would cause the rock to erode and in some cases break apart creating this natural wonder. Currently from the entrance the gorge extends 55 m (180 ft) into the mountain. The higher up you go the more it widens and at the top balcony it extends to 73 m (240 ft). 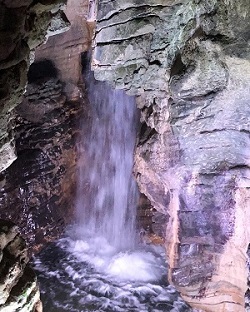 The waterfall itself drops 98 m (322 ft) down the gorge. Erosion still continues and it is estimated that two millimeters each year are washed away from the rocks. Prior to 1874 this area was inaccessible due to the steep cliffs. The only way you could access this was by climbing up the waterfall itself. Since then bridges, steps, pathways and balconies were created opening up this natural wonder for everyone to enjoy. On June 20th, 1874 under much pomp and circumstance with the King of Saxony and Prince of Montenegro in attendance the waterfalls were open to the public. What sets this apart from the thousands of waterfalls around the world is that the waterfall created a huge gorge that it empties into. 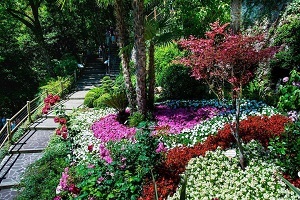 To enhance the beauty of the area the slopes where cleared and flora from around the world were brought in to create a botanical garden as well as a Zen garden, both of which are on full display as you make your way from the lower cave to the upper cave. Your journey starts at the bottom. Once you purchase your ticket you climb a set of steps and enter the grotta inferiore (lower cave). 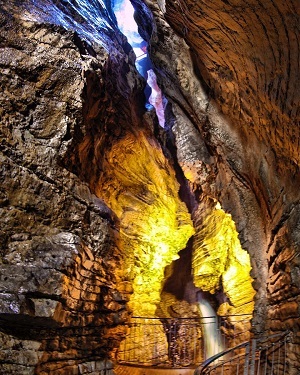 The lower cave has a platform for you to walk on that rests just above the water. The first thing you will notice is the deafening sound from the water as well as a fine mist in the air. If you do not like getting wet you may want to wear a poncho. As you make your way along the bridge you will notice that the rocks all have horizontal striations and even though it appears you are going deeper into a cave you are actually in a very narrow gorge. Once you exit the lower cave you will be on the path that will take you up to the grotta superiore (upper cave). There are over 100 steps that you will navigate up the hillside. The path gives you stunning views of the valley and you are surrounded by flowers and trees from the botanical garden. When you reach the upper cave you will go through a 15 m (49 feet) man made tunnel that will take you right into the heart of the mountain. Two platforms will allow you to watch the waterfall descend into the abyss. 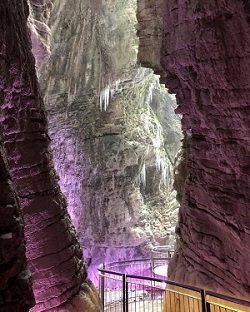 Unlike the lower cave the rocks have different formations. If you look from the right balcony up the wall you can make out the image of a horsehead. The journey back down is much easier, but don't rush and take some time to enjoy the views. The park is open year round except on December 25th. You can visit the park's website for hours and ticket pricing. Unfortunately the waterfalls are not handicap accessible. It is recommended that you wear comfortable shoes and a poncho if you do not like to get wet. Keep in mind that the higher you go the colder it will get and when you are in the cave the temperature will be cooler as well. Photo copyright © Parco Grotta Cascata Varone. Used by permission. All rights reserved.